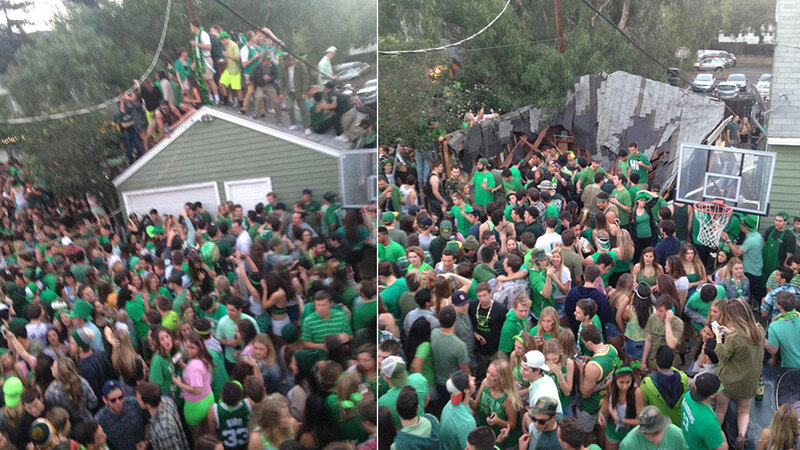 SAN LUIS OBISPO, CA -- Eight people were injured when the roof of an outbuilding collapsed during a pre-St. Patrick's Day block party near Cal Poly San Luis Obispo Saturday. About 30-40 attendees were standing on the garage roof when it caved in, the San Luis Obispo Fire Department confirmed. The party, which had at least 1,500 attendees, began early Saturday morning and was still ongoing when fire crews responded to the incident in the 300 block of Hathway Avenue at about 6:21 a.m.
A roof collapsed during a pre-St. Patrick's Day block party in the 300 block of Hathway Avenue in San Luis Obispo Saturday, March 7, 2015. A mass casualty incident was declared as three fire paramedic-staffed engines and the Battalion Chief arrived on scene. A video posted on the college's newspaper's YouTube page showed the roof collapse. One victim was impaled in the thigh by a piece of wood as the roof collapsed. Seven other victims were treated for minor injuries, according to the San Luis Obispo Fire Department. "I think we are very, very lucky there weren't more serious injuries or fatalities," said San Luis Obispo fire Chief Garret M. Olson. Cal Poly released a statement following the roof collapse Saturday: "Cal Poly is also in close contact with local public safety agencies as they work to determine exactly what occurred. Their findings will help inform our own efforts to ascertain what led to this incident and decide how we will respond." Police said three people were arrested and charged with misdemeanors.